Since my family hit it out of the park for Mother’s Day, I knew I had to step up and do something pretty spectacular for Father’s Day. For some inspiration, I headed on over to Pinterest. Smart move. After perusing loads of DIY gift ideas, I quickly became motivated to create a homemade masterpiece. I was not entirely sure just what, but I knew it was going to be amazing! Armed with a surplus of Pinterest ideas and the confidence to craft that only Martha Stewart could rival, I headed to Michael’s. I was not deterred by my lack of craft ability or experience. You don’t believe that I’m not a skilled crafter? Just scroll down to see the picture of my creation for additional evidence. That was my work of art. I will admit the super cute hand-print in the picture above is my son’s which was the one bright spot in this endeavor. While wandering around Michaels, I was flooded with loads of genius ideas. Suddenly I spotted a Personalize It Mug Kit. That’s it! I have found the perfect DIY Father’s Day gift idea. 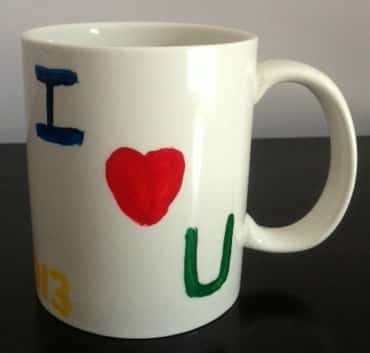 This mug kit was from Creatology and it included a mug, 4 paint pots of red, green, yellow and blue paint, and 1 brush (in my opinion, reason #1 why the mug did not turn out as planned). I eagerly snatched up my mug kit ready to get crafting. I decided to attack this craft project on a day when my mom was visiting, so she could assist with my 1 year old son since we had to paint his hand. We were going to take pictures as we performed this DIY project, but let’s just say, as my craft high was wearing off, I decided that may not be entirely necessary. 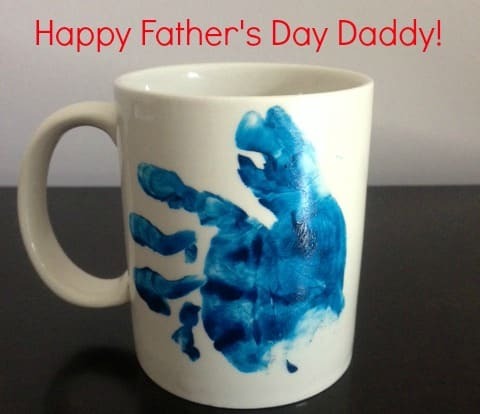 We started the project by painting my son’s hand blue and smack my mom placed my son’s hand on the mug. A beautiful blue hand-print was born! What father can resist a mug with his son’s hand-print, right? The only thing that could make this mug even better would be if the mug said, “I Love Daddy.” This is where I come in. With the super small, virtually impossible to hold mini paint brush, (can you tell I’m still bitter? ), I started writing “I” and making a heart for the word “love.” Those were not too terribly difficult though I did repaint the heart about 15 times. On a side note, the best part about this kit is the paint is washable and allows you to wipe clean and start over if you are unhappy with the results. Now for the word “Daddy”…. By the way, why does this word have to have so many D’s? Talk about impossible! How can anyone be expected to line up three D’s perfectly with just a utensil suited only for a child (whoops, I guess that’s the idea, right?) Anyway, my mom can attest that I gave it my best effort to write the word “Daddy; however, since I was never quite satisfied with my work, I finally settled on “U.” Yep, that’s right, some may say I wimped out, gave up or allowed my perfectionist tendencies to get the better of me, but I beg to differ. I simply wanted to create the most perfect, incredible Father’s Day mug ever but still maintain some level of sanity in the process. Though my DIY Father’s Day craft project did not turn out as perfectly as planned, it did teach me a few very valuable warnings, I mean lessons. Care to share some of your crafting experiences? I’d love to hear about your triumphs and epic fails.